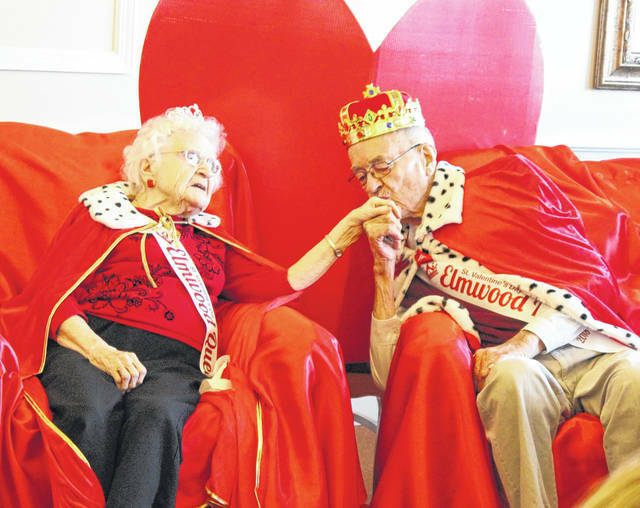 The photograph of Joe Wuebker kissing the hand of Melba Bender after the were crowned 2018 Valentine’s Day king and queen at Elmwood of New Bremen was winner in the Ohio Health Care Association’s 2018 photo contest. 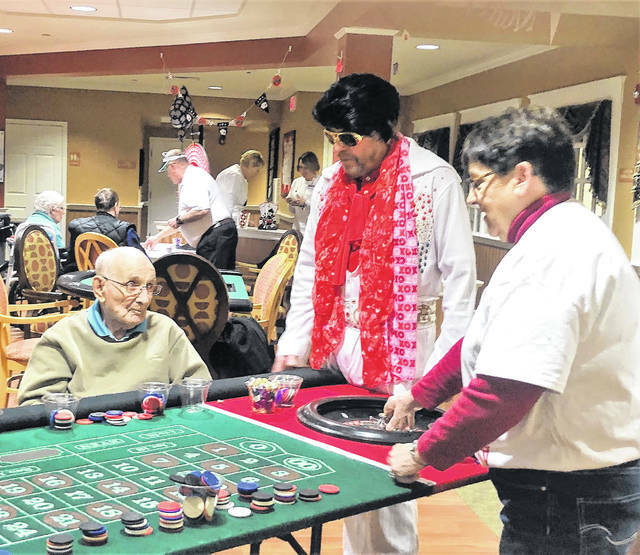 Poker dealer Gordon Luedeke deals hands for Elmwood residents Paul Bornhorst, Gene Reithman, Rita Harting, Louella Klenke and Oneda Horstman during casino night. 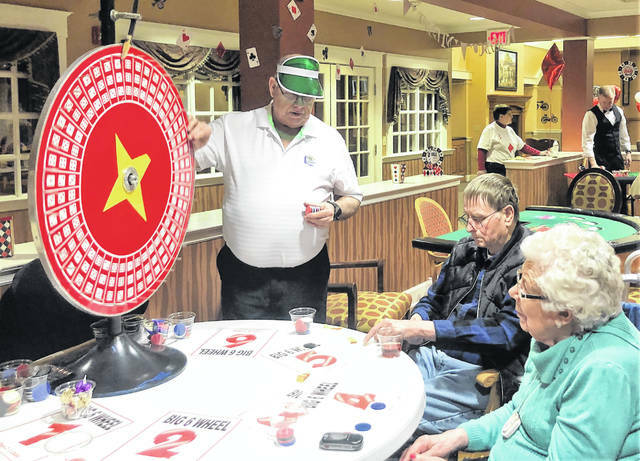 Barney Gruebmeyer gets ready to spin the wheel for residents Yolanda Schmeising and Earl Berning during casino night at Elmwood Assisted Living of New Bremen. Francis Thobe, Jane Gruebmeyer and Nick Bruggeman get ready to spin the roulette wheel during casino night. NEW BREMEN – A kiss on the hand on Valentine’s Day in 2018 was the winning photograph in the Ohio Health Care Association’s 2018 long term care photo contest. Marge Luedeke, Elmwood Assisted Living of New Bremen program coordinator, said their Valentine’s 2018 photo titled “Never Too Old for Romance” won the top prize of $500 in the contest. The photo featured Joseph Wuebker, newly crowned king of Elmwood, kissing the hand of newly crowned Queen Melba Bender. Luedeke said they decided to use the prize money for a dinner honoring the families of Bender and Wuebker and then hold a casino night for the whole facility. 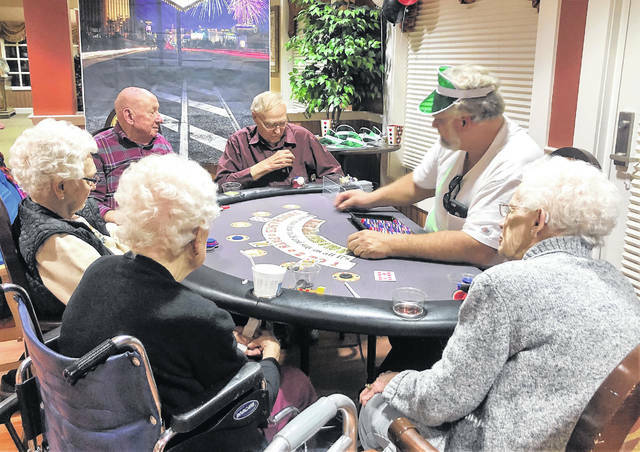 The casino games of chance included a roulette wheel, poker table, and at the spinner at which residents were given the imitation money to play the games. Elmwood staff and friends served as the hosts for casino night. They included Luedeke, her husband Gordon Luedeke, Jane and Barney Gruebmeyer, Curt Eversman and Nick Bruggeman. To see the winning photos go to http://www.ohca.org/photo_contest_2018_winners.